Imagine a children’s book illustrator and you may as well picture Sally Heinrich. With a smile that lights up the room, she genuinely embodies the playfulness and creativity of the worlds she creates in picture books. During her career, the Adelaide artist has illustrated more than forty books (which include some of her own picture books), non-fiction books, activity books and novels. A trained graphic designer, Sally has also worked for clients in advertising and environmental agencies, design studios and government departments. She’s designed several wine labels, created a mural for the Singapore Zoo and drawn one-off pieces for weddings and birthdays. Sally at work in her studio. 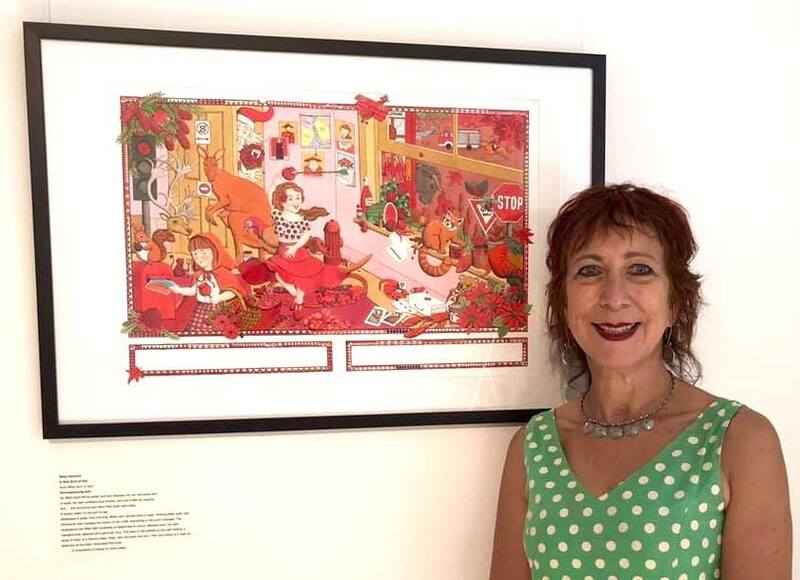 Sally’s work has been recognised through fellowships from the Asialink Foundation, The May Gibbs Children’s Literature Trust, Varuna-the Writer’s Centre and Arts SA, and her original artwork and lino-prints have been exhibited in Australia and Asia. 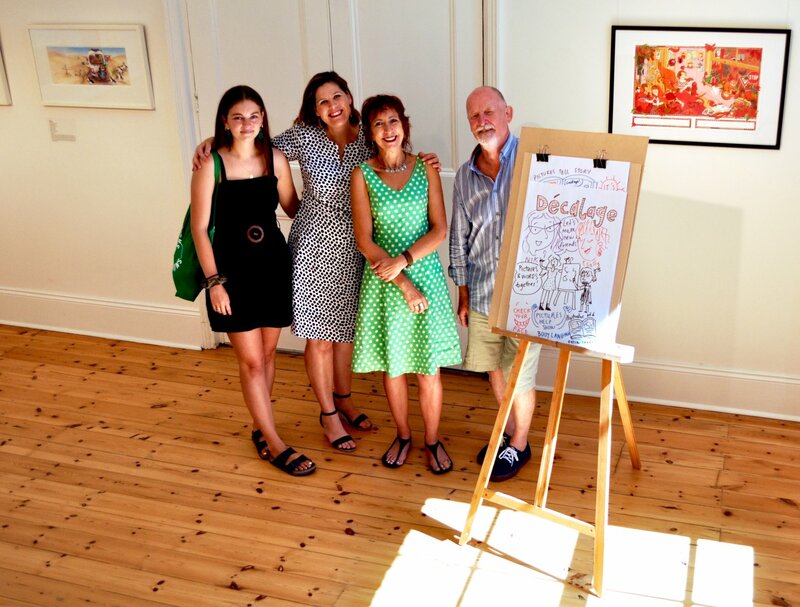 She recently curated Gallery 1855’s Adelaide Fringe Festival exhibition for 2019, Décalage, a body of work showcasing South Australian children’s illustrators. While each work may be a scene from a children’s book, they each stand on their own as an individual piece, telling a story. Décalage shows just how much is involved in the creation of children’s pictures, as they must work with the words of the story, to the most honest audience of all: young children. Sally has brought together 10 SA illustrators in this collection, including Donna Gynell, Mandy Foot, Linda Catchlove, David Kennett, Danny Snell, Jennifer Harrison, Timothy Ide, Amanda Graham and Georgina Chadderton. Décalage is a French word used to express the way two things don’t fit together, like the shift in time between one country and another. 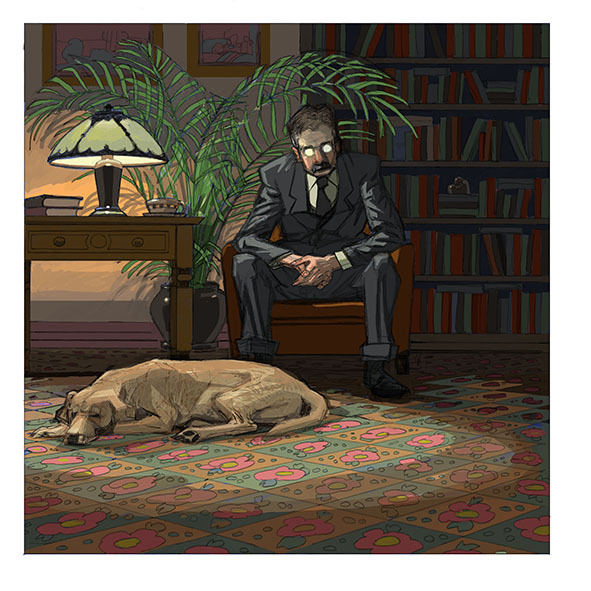 In a picture book context it expresses the disparity of meaning between word and image. There are many ways this can happen. For example, the words might be saying one thing and the pictures showing another. It’s this space between word and picture that I find particularly exciting about picture books as a creative medium. The space that requires the reader to make connections and also allows room for the reader’s imagination. The sum – of the words and pictures – can be far greater than the parts. Danny Snell, Pussycat at the door, 2018, mixed media, digital print. From Let’s Go Strolling. Written by Katrina Germain. Little Book Press. I was asked to curate an exhibition and a fellow illustrator, Donna Gynell, who is one of the participants, suggested the theme. It immediately resonated because it is the thing I find most exciting both as an illustrator and reader of picture books. I discussed it with other illustrators and they were all enthusiastic about the idea. I also saw it as an opportunity to give a glimpse of the world of illustration to a broader audience, who may either not be aware of picture books, and/or may be dismissive of them as a simple entertainment for young children. I believe that picture books are under appreciated by many, and that some of the finest and most exciting artwork being produced in the world can be found in picture books. David Kennett, Evening armchair, 2017, digital print with pencil. All illustrations from Armistice. Written by Ruth Starke. Working Title Press. Where did your interest in art begin and how long have you been a practicing artist? As long as I can remember I was making up stories and drawing. When I was in Kindergarten my sister was studying to become a teacher and she would often sit with me and annotate the drawings I did. It was fascinating to look back at some of them and see how much of a story was behind very simple images! After High School I studied Graphic Design at what is now Uni SA, and majored in illustration. I’ve been working as a freelance illustrator and writer ever since graduating. My work has encompassed advertising, publishing and increasingly workshops and community art projects. 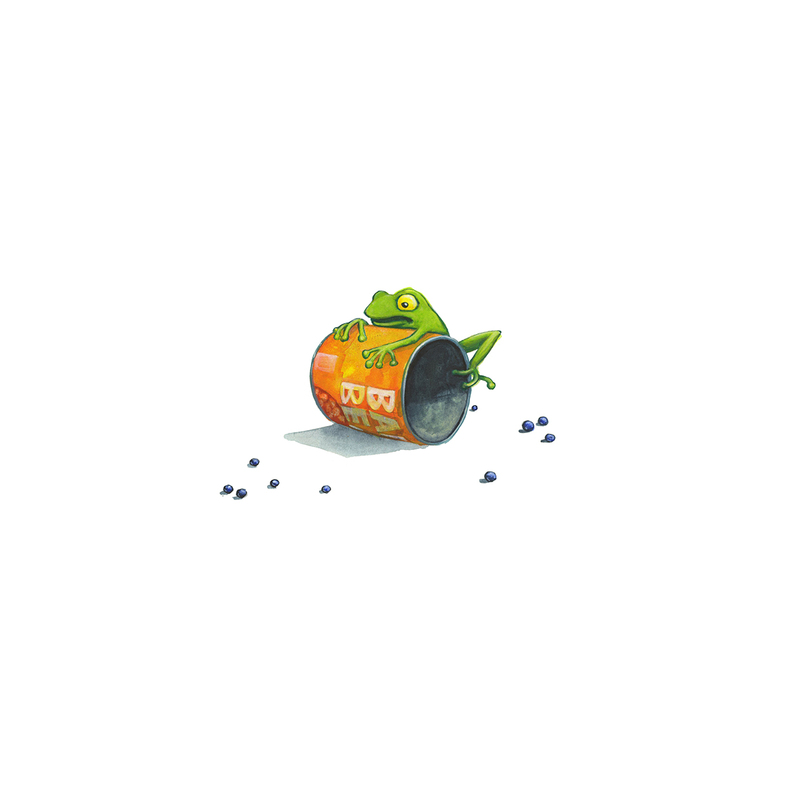 Amanda Graham, Frog on a Can, 2006. Watercolour. From Bushranger Bill. Written by Megan de Kantzoe. Omnibus Books. 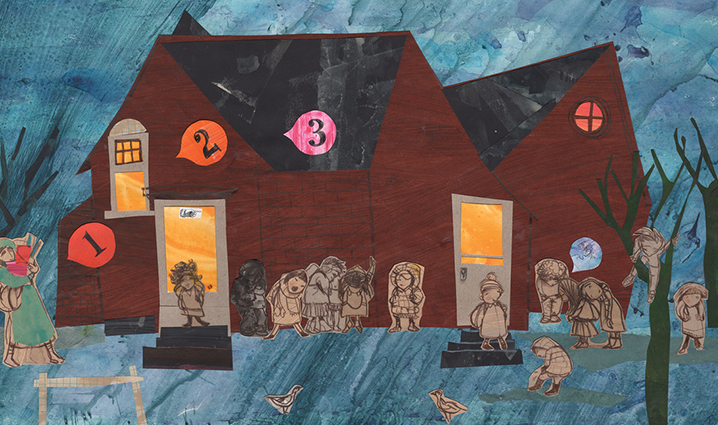 You say that illustrating picture books is a more complex undertaking than many people realise. Why is that? Illustrating a book is far more than just creating a series of single images. They must connect and be consistent, while working within the boundaries of a set size and number of pages. 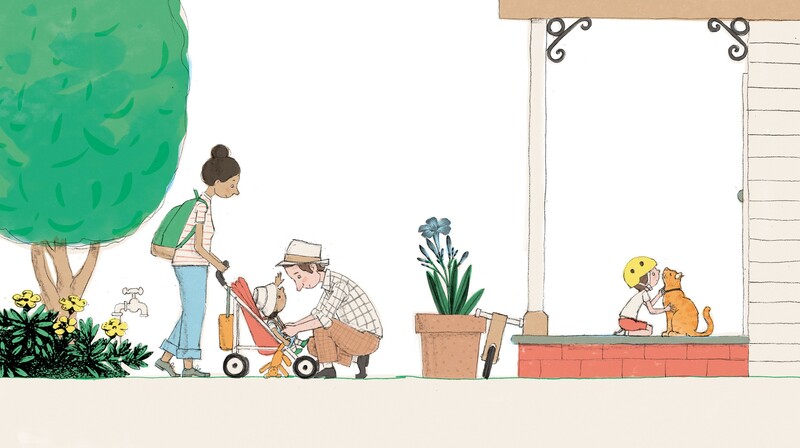 The illustrations in a picture book – or at least in the best ones – are not simple reflecting what the words are saying. They are expanding on the text and enhancing it, and playing an integral part in the storytelling. I would say that as much as 90% of illustrating a book goes into the thinking and planning. That is not to take away from the other 10% which demands a high level of technical and drawing skills. For example, it is easy enough to draw a character once, but in a book you need to recreate that character over and over, showing different emotions, engaged in different activities and from different angles. This is just one of the challenges. It demands a huge commitment of time and focus. 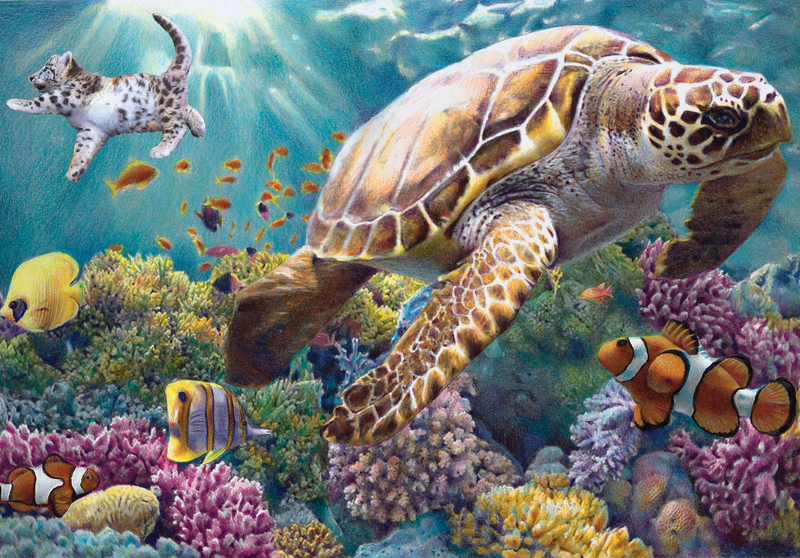 Jennifer Harrison, Rainbow Reef, 2018. Colour pencil. From Vanishing. Written by Mike Lucas. Midnight Sun Publishing. There’s rather a lot of South Australian children’s illustrators. How hard is it to ‘get into’ the industry? That’s a hard question and there’s probably not a definitive answer. Everyone has their own story. It certainly requires focus and commitment. The children’s writing and illustrating community though is extremely generous and supportive of people who are trying to get into the industry. There are professional organisations which are open to unpublished creators, workshops and courses and mentorships. I would say that it isn’t easy, but possible for anyone with passion and commitment. The monetary returns are not necessarily in any proportion to the amount of work often involved, so I believe that most of us who do it, do it because of that passion. Georgina Chadderton, Oh Brother, 2019, Digital print on archival paper. 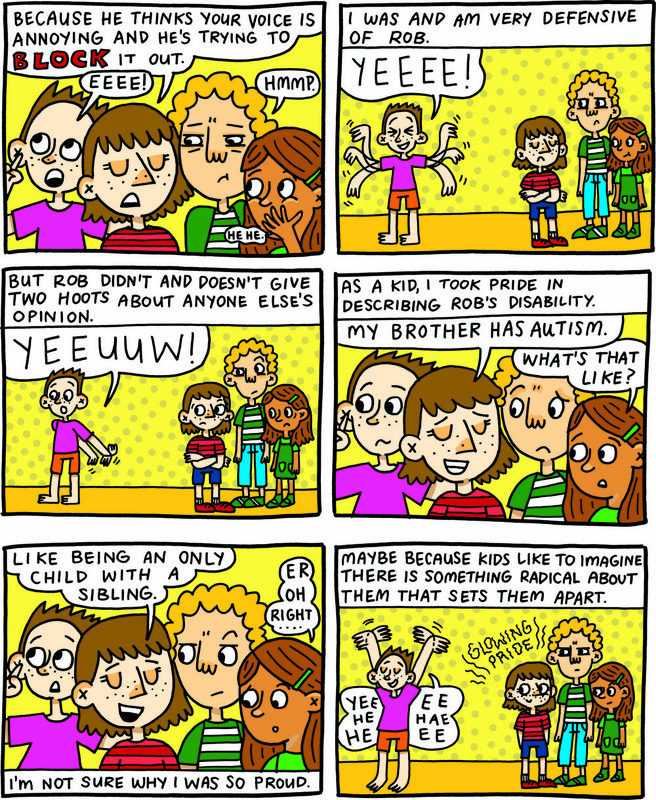 Forthcoming publication: Oh Brother: growing up with a brother with autism. Author: Georgina Chadderton. You have lived in Darwin, Sydney, Singapore and Malaysia, and are now based in Adelaide. Have all of these places had an influence on your work? Most definitely. The most obvious is the Asian content in much of my work. I think that you can’t help but be influenced by everything in your life whether you realise it or not! Donna Gynell, Dancing with Ruby, 2017, hand assembled mixed media collage. Illustration on pages 4-5 of publication. What are you working on next and what are you looking forward to? Gosh – I’m working on two picture books, one is a companion to Papa Sky, which I hope to have finished by the middle of the year. I am also working on a graphic novel with Shamini Flint. In between I have a couple of printmaking projects, running some workshops in illustration and writing, and the occasional commercial job all necessary to keep food on the table while working on the books. I’m looking forward to the second half of the year when I’m hoping to be able to commit my time to completing my own wordless picture book which has been waiting to be done for many, many years, and also completing a novel which likewise has been worked on, on and off, for many years. Decalage is Gallery 1855’s Adelaide Fringe Festival exhibition for 2019, on display from 6 Feb-16 March. It will then be on display at Tea Tree Gully Library from 3 April – 2 June 2019.